Hill's Prescription Diet Canine u/d has been developed for dogs suffering with Urolithiasis (mineral stones in the urinary tract). This condition is marked by a variety of unpleasant symptoms, including difficulty with urination, frequent urination, bloody urination and a painful abdomen. Following surgery to remove the troublesome mineral stones, dogs are most often provided a nutrition plan to help reduce the risk of Urolithiasis recurrence. Hill's Prescription Diet u/d has been specially formulated to aid in the management of dogs with this complaint, as well as dogs suffering with advanced renal disease due to the formulation's low mineral content. These ranges are a starting point only, because dogs' needs vary.Adjust the feeding amount to maitain optimal body weight. Nucleic acids Reduced Urolithiasis: Decreases urinary concentration of constituents of urate, oxalate and cystine uroliths. Target urinary pH Alkaline: pH 7.1-7.7 Discourages formation and aggregation of non-struvite crystals. Protein High quality & reduced Kidney disease: Reduces accumulation of toxic protein-breakdown products. Non-protein calories Increased Ensures adequate energy, avoiding protein catabolism. Phosphorus Reduced Slows progression of kidney disease. Dietary buffering capacity Increased Helps counteract metabolic acidosis. Sodium Reduced Helps slow progression of kidney disease. Helps limit fluid retention in early cardiac disorders..
B-complex vitamins Increased Combats increased urinary losses due to polyuria. Copper Reduced Avoids copper toxicity due to defective elimination of copper by the liver. Beta-carotene High Neutralises free radicals to help combat urolithiasis. Vitamin C is not supplemented because it is a precursor of oxalate. Ingredients (Dry): Original: Brewers´rice, maize starch, animal fat, dried whole egg, cellulose, minerals, digest, flaxseed, dried beet pulp, soybean oil, trace elements, L-carnitine, vitamins, taurine and beta carotene. With a natural antioxidant (mixed tocopherols). Ingredients (Wet): Original: Maize starch, dried egg, animal fat, pork liver, various sugars, rice, minerals, cellulose, flaxseed, trace elements and vitamins. Dogs fed u/d™ Canine long term should be monitored for the development of protein depletion. For struvite uroliths: Prescription Diet™ s/d™ Canine (dissolution), or Prescription Diet™ c/d™ Canine (reduction of recurrence). Dogs with hypoalbuminaemia, hyperlipidaemia or pancreatitis, or with a history of, or at risk of, pancreatitis. 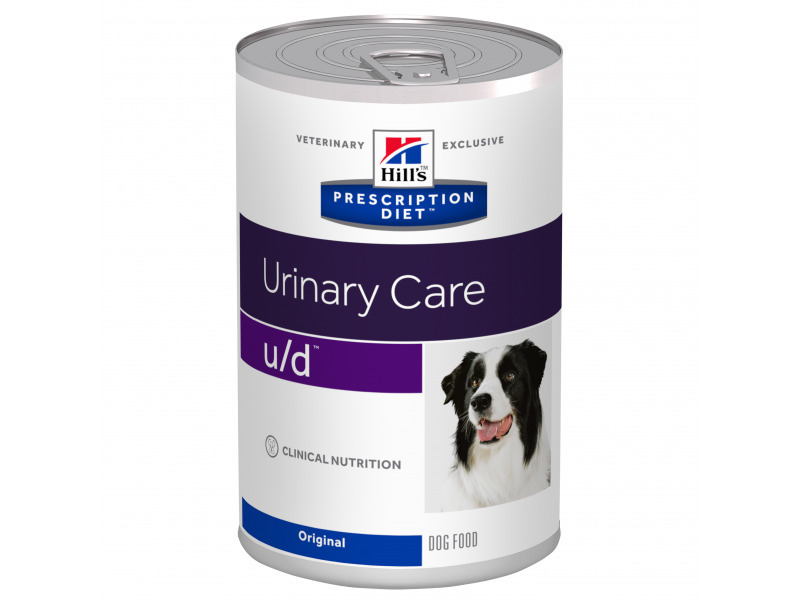 There are currently no questions for Hill's Prescription Diet u/d Urinary Care Original Dog Food - be the first to ask one!